Wash and clean your clothes in an all encompassing way with the Whirlpool ACE 7.2 SUPREME 7.2 kg Semi Automatic Top Loading Washing Machine. 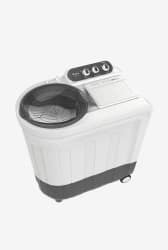 This washing machine sports a compact design to load and unload clothes conveniently. The various wash programs allow you to wash specific pieces of clothing according to their washing requirements. This Top Loading machine has a body made of high quality material that increases durability. Moreover, it comes fitted with a big wheels so that you can easily move the machine around making it more robust and stable.